That title can seem a little off-putting when we think about it; we don’t like to think that God ‘hates’ anything! But the first commandment says, “You shall have no other gods before me” (Exodus 20.3). Scripture offers us a great illustration of this truth in the story of Elijah squaring off against the prophets of Baal in 1 Kings 18.16-39. During this service, we had the company of members of our regional police, EMS and township fire services, to thank them and bless them for their service to the community. In small group conversations, confidentiality is key, so I won’t share any revealing details about this situation, but the way it was handled deserves to be highlighted for our edification. Last night, during one of our LifeConnect Groups, a member was talking about a crisis of which she had been made aware, and that she and another Christian friend had prayed together over the telephone for the individual involved in the crisis. To me, this is a marvellous example of the body of Christ at work: no need to wait for a ‘religious professional’ to intercede on your behalf – just pray! What I especially loved about the way she described the experience, though, was that they had been “talking to Jesus on her behalf.” I love that turn of phrase! 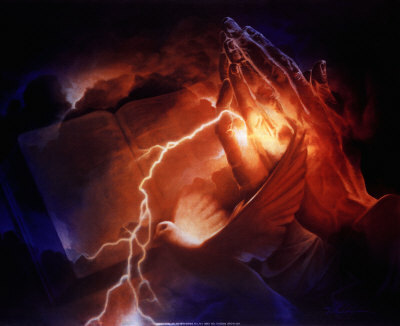 The really ‘churchy’ word is “interceding”, and the moderately ‘churchy’ word is “praying for”. But “talking to Jesus on her behalf” just captures the true meaning of prayer for others! And there’s a witness to be had in situations such as this. The individual being prayed for, it turns out, had had the potential to sustain a life-altering injury, but ended up with nothing more than a sore neck – a miracle, of a sort, for which two Christian women had been “talking to Jesus on her behalf.” Isn’t that amazing? The witness comes when we tell that other person that we believe her miracle came about as a result of “talking to Jesus on her behalf.” That can have an immense impact. “Every time I think of you, I give thanks to my God. Whenever I pray, I make my requests for all of you with joy, for you have been my partners in spreading the Good News about Christ form the time you first heard it until now” (Philippians 1.3-5, NLT). So when you pray for others, don’t hesitate to tell them that you have been “talking to Jesus on their behalf.” It will encourage believers, and draw others closer to the Lord! There’s only one place in the whole Bible where God invites us to test him: it’s in Malachi 3. And recognizing how blessed we are as people living where we do and under the circumstances we do, it’s vital that we understand what it means to be blessed. Luke 16.10-13 shows us how difficult it can be for us to understand how blessed we are, because money tries to be a god for us. You can listen to this message, “Blessed and Tested”, by clicking here. This is an article I prepared for The Gatherer, the newsletter of St. Paul’s Church, Nobleton where I serve as Lead Pastor. It will appear in the June issue, but I thought I’d give blog readers a preview. It’s not an easy subject, but I’d be glad for your comments and constructive criticism. stations, who has gone to great trouble and expense to alert the world to his reading of Scripture, which leads him to the conclusion that the beginning of the consummation of the world was supposed to take place on Saturday, May 21, 2011.
valuable time to attempt to figure out when all this will take place. As one friend wrote on this blog, “too many believers spend far too much time peeking down the hall to see if the Lord is coming that they forget their need to be out working in the field.” If these folks who were putting their energy into predictions instead put their energy into growing God’s kingdom, we might get closer to fulfilling the Great Commission! God’s judgment is certain. See Romans 2.5-11. God’s judgment will separate believers from unbelievers. See Matthew 13.24-30. The negative results of God’s judgment will not be pretty. See Matthew 13.40-43. Believers will participate in the judgment. See Revelation 2.26-28. One of the more popular stories outlining the coming judgment is found in the parable of the sheep and the goats in Matthew 25.31-46. On the surface, this ap pears to be a works-based judgment, yet we believe in a faith-based salvation! Why this apparent discrepancy? We need to read the text more carefully, for there are layers of meaning behind it. First, we need to understand that the criterion of judgment is not how we treated other people, as important as that is; the criterion of judgment is how we treated Jesus. Did we love Jesus enough to care for him? That’s what matters, ultimately, in the judgment. Lesser criteria have to do with how we lived out our faith, but how we lived out our faith does not determine our final, eternal destiny. In parabolic terminology, followers of Jesus will be sheep, and those who did not follow Jesus will be goats. Of course, this is a very simplified reduction of what Scripture says about judgment, but my purpose here is to assure you that if you love Jesus, if he is Number One in your life, you do not need to fear the coming judgment – whenever it may come. Those we know (and those we don’t) who have not made Jesus Number One in their lives, however, should fear the coming judgment. But our goal is to help them experience the blessings of the Christian life, and let that draw them to faith. Fear and intimidation is unlikely to work. So if, by faith, you are ready for Jesus’ return, fear not. We don’t know much about what the end of time will look like, in spite of the snapshots the Bible gives us. 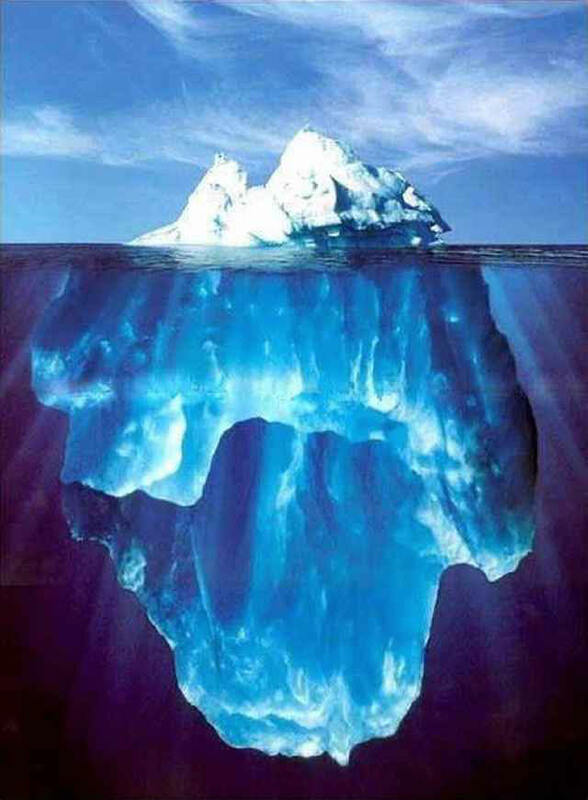 What Scripture tells us about the final judgment is like the part of an iceberg that we can see: it is, quite literally, just the tip of the iceberg. Because we can’t see more, we must trust. And isn’t that, after all, what the life of faith is all about? Last week, I wrote about the noteworthy fact that a group of Christians in the United States believes that the final judgment of humanity will take place tomorrow. Yep, tomorrow: May 21, 2011. And I wrote about how sceptical I am about that, because even Jesus said that only the Father knows for sure when all this will take place. When we casually read the book of the Revelation, at the end of the New Testament, it is easy either to become scared or confused by what we read. Part of that is a response to the nature of apocalyptic literature. These reactions also can occur when we’re reading about something that seems generally foreign. Revelation is about a cosmic battle – a spiritual war that is beyond what we can understand or imagine. That makes it, naturally, confusing. But as I also wrote last week, if we have trusted Jesus as Lord and Saviour and are ready for his return anytime in the next five minutes, there’s nothing in that book we need fear. “Keeping watch” is a common theme in the gospels, and a happy one: Jesus tells the people to keep watch for his return; the father kept watch for the return of his lost son. What does it mean for us to keep watch? We can’t keep watch for what, or whom, we don’t know. So Step Number One is to know Jesus as Lord and Saviour. “If you confess with your mouth, ‘Jesus is Lord’, and believe in your heart that God raised him from the dead, you will be saved”, said Paul in Romans 10.9. And once we know the Lord Jesus by faith, it’s natural for us to long to see him face-to-face, which will happen either when we die or when he returns, whichever comes first. When my wife goes away on business trips, I can’t wait for her to come home – that’s how much I love her. I wait for the phone to ring to tell me she’s landed at the airport and it’s time to pick her up. My heart goes all a-flutter while I’m driving down the highway, because I’m going to see the one I love face-to-face again. I want us all to feel that way about Jesus, too. We wait expectantly, and we ‘keep watch’, but we can’t predict when he will come again. But to know him is to love him, and to love him is to wait confidently, knowing that whatever may unfold at the consummation of time, we will know and be known by the One who consummates time. So if the judgment happens tomorrow, will you be ready? If you know and trust Jesus, you are ready. Be confident, and trust in his grace to carry you safely through. And if judgment doesn’t happen tomorrow, we’ll talk again next week. 🙂 God’s best! Do you know how blessed you are? So often, people understand their blessedness – maybe calling it ‘luck’ or ‘fate’ – but assume it’s all about them. Yet the Bible tells us that we are not blessed for our own sake, but for the sake of blessing others. This message, which begins with the biblical maxim “It is more blessed to give than to receive” (Acts 20.35), is based on 2 Corinthians 9.1-15, and you can listen to it by clicking here. Will the world end in 2011? You may have heard that there are certain groups and individuals who are proclaiming for all to hear that the final judgment of humanity is going to happen on May 21, and that the end of the world will take place on October 21…of this year. There are many people within and outside the church who are making fun of those who believe they have these dates figured out, and while that can provide a few moments of joviality, this proclamation does cause us to stop and think, doesn’t it? There have been doomsday prophets lurking around this corner and that for at least the last 1900-plus years, and quite possibly longer. Occasionally, cult groups will predict the end of the world, as the Jehovah’s Witnesses have done several times. (One time, back in the 1970s, when the JWs had a fixed date for the End, my mother-in-law invited a bunch of them for tea…for the day after. She’s a bit cheeky, you know.) Countless books have been written, each attempting in its own way to tell us how the world is going to end, and when the world is going to end. Even mainstream Christians have sometimes tried to figure these things out from Scripture. But here’s my take on it: those who seek to divine these bits of information, as important as they may seem, betray a profound lack of trust in God. We want to try to figure everything out, to leave no stone unturned as we seek to have all matters of faith laid bare for us. Yet, it seems to me that it is hardly a matter of faith when we seek to make everything logically explainable. As I heard the great Pastor and Bible Translator, Eugene Peterson, say this week, “Our gospel is 80 percent mystery.” And our society does not like mystery. It may like mystery novels or mystery TV shows or mystery movies, but the reason our society likes those is that, within a matter of hours, they will have the mystery solved. But the mystery of faith is not something that we can solve in hours, or days, or years. In fact, we can’t solve it at all. That’s God’s job. God will solve the mystery of faith, but only in his own time – not necessarily according to our not-always-flexible timetables. Followers of Jesus know that the world as we know it will not last infinitely; we know that there will be a judgment, and there will be a consummation of the world as we understand it. But one thing that isn’t a mystery to us is that we don’t know when that will take place. Jesus himself said, “no one knows the day or hour when these things will happen, not even the angels in heaven or the Son himself. Only the Father knows” (Matthew 24.36, NLT). We don’t know when the judgment will happen, or when the world as we know it will end. But we do know the One who knows. And that’s all that matters. All we have to do is be ready for it. This week, I will be beginning a study of the book of the Revelation in one of our LifeConnect Groups at St. Paul’s, Nobleton. People are often fascinated – or even scared – by Revelation, because of the cryptic material it contains. But I generally begin a study in Revelation by saying this: if you believe that Jesus is going to return, and you are ready for that to happen anytime in the next five minutes, there is nothing for you to fear in Revelation. So don’t let the fear-mongers get to you. And don’t be convinced by those who think they have the mysteries of the universe solved. Trust the Lord. Be ready. Let God set the timetable.